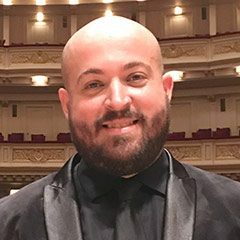 This November, the Pacific Symphony Youth Wind Ensemble will premiere Giovanni Santos’ (MM ’07, Music Education) latest work, Fanfariaat, at the Segerstrom Center for the Arts in Costa Mesa. The composer, who serves as Director of Wind and Percussion Studies at La Sierra University, has premiered works across the United States and Europe. In January, Santos conducted the United States Naval Academy Band Brass Ensemble in the premiere of his piece, Voyagesat, at the John F. Kennedy Center for the Performing Arts in Washington D.C., and later performed it with the La Sierra University Wind and Percussion Ensemble at Carnegie Hall.